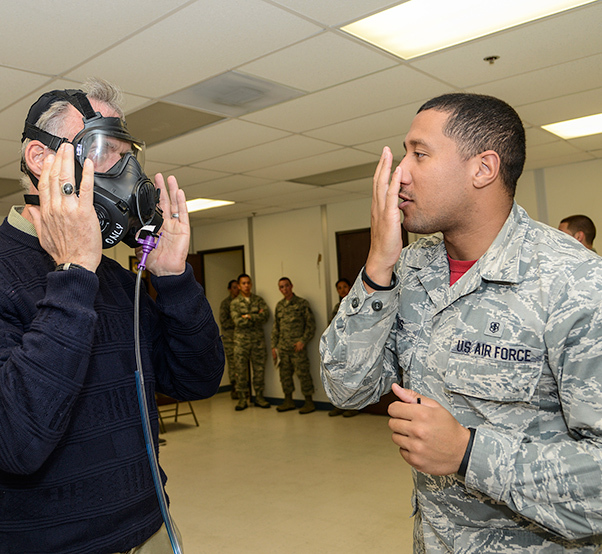 Some honorary commanders were selected to be fitted for gas masks at the Deployment Processing Area by 412th Medical Group Airmen. 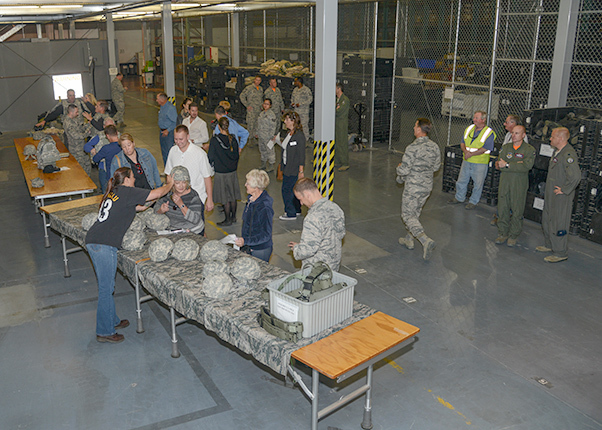 Edwards AFB Honorary Commanders geared up for a simulated 179-day deployment to “Deployedistan” in a fast-paced deployment processing orientation tour Nov. 6. The group arrived just before noon, and by 3:30 p.m., they were being loaded on a C-17 and issued “deployment” dog tags. The goal of the tour was to put honorary commanders in an active duty Airman’s boots and show them what would happen if they had to deploy tomorrow. After receiving their deployment orders, the group was taken to the Combat Arms Training and Maintenance building where they were given combatives instruction. The 412th Security Forces Squadron offered a weaponry and vehicle demonstration as well as a firepower demonstration. Then it was off to the Explosive Ordinance Disposal facility where they were greeted by a severely injured dummy in need of immediate first aid. After learning to address the potential serious medical situation, they went through the stages of improvised explosive device awareness and several people tried on the proper explosives bomb suit. The stop to EOD ended with a bang when they demonstrated a controlled explosion. Once they were “trained” to use their weapons, watch for explosives and tend to injured soldiers, they went to the Deployment Processing Area. The group was divided into two smaller units called chalks and a group leader was assigned. The group leader was responsible for accountability of their group. Honorary commanders geared up for a simulated 179-day deployment to “Deployedistan” in a fast-paced deployment processing orientation tour Nov. 6. The first chalk started with a 412th Force Support Squadron military personnel briefing about accountability. The Airman and Family Readiness Center outlined their services for the families that would remain here. The 412th Medical Group fitted them for gas masks and provided immunizations before sending them for their final brief about the location and duration of their mission. Meanwhile, chalk two was being issued their deployment equipment. They tried on full gear including magazines and weapons — everything that a deployed member would carry. 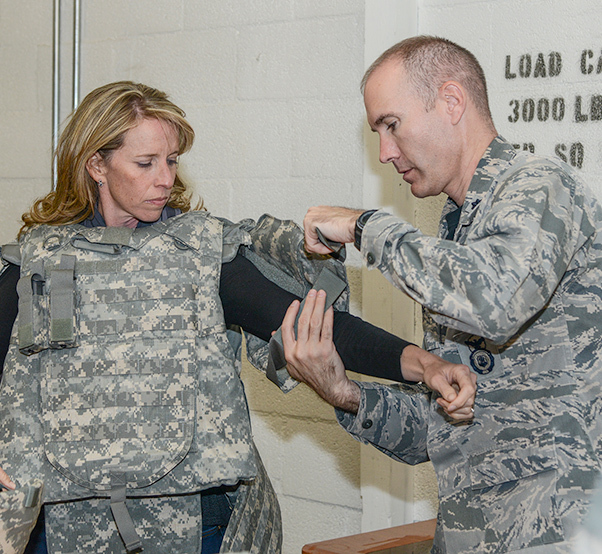 Each honorary commander wore roughly 35-40 pounds worth of equipment. On a nearby table the contents of three equipment kits were laid out so the items could be clearly seen. Each person was issued a C-bag, which they carried outside and dropped onto a pallet before getting onto the bus for the next stop. “What we did there was the personnel deployment function. 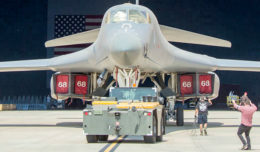 For real-world deployments [our job] is to bring people in, make sure they have all the training they need, all the certifications,” said Michael Moran, 412th Logistics Readiness Squadron, installation deployment officer. Each honorary commander was able to try on full gear including magazines and weapons — everything that a deployed member would carry. The gear is roughly 35-40 pounds worth of equipment. The final stop took them to the flightline where they watched a fuels truck and fire truck demonstration and then boarded a C-17. They were issued keepsake dog tags and then informed that their “deployment” had been cancelled and they were sent home. According to Moran, the Deployment Processing Area maintains the ability to deploy the entire active duty wing, roughly 1,600-1,700 people within 24-72 hours. What the honorary commanders experienced was just a taste of their capabilities. 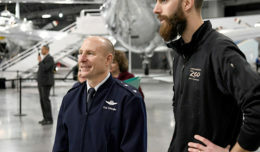 The Honorary Commanders Program pairs community leaders with Air Force commanders at Edwards AFB to foster a better working relationship between Edwards and the neighboring communities. The honorary commanders are invited on base several times throughout the year to experience some of what the base has to offer. In turn, some HCCs may invite their commander to experience what the local community has to offer. 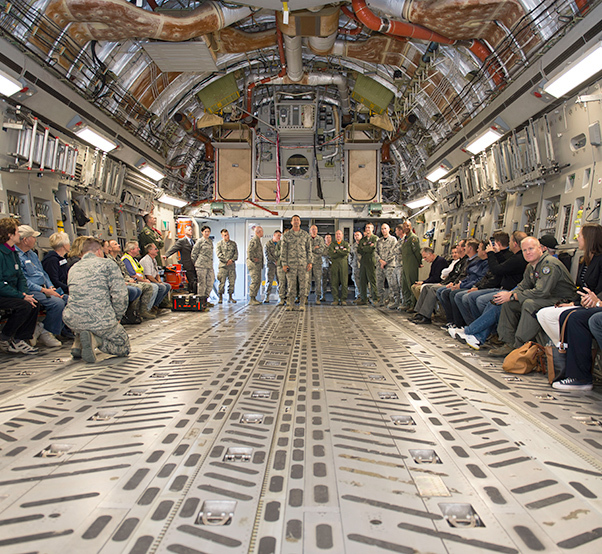 The honorary commander’s simulated deployment ended on a C-17 where they were issued keepsake dog tags.